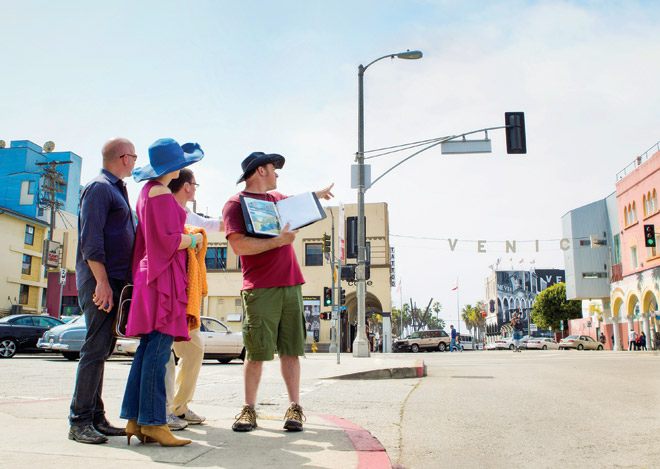 Jonathan Kaplan shows off the corner of Pacific and Windward avenues in Venice. Wanna meet someone? Get some proper shoes and join a walking tour. For the May issue’s Best Of L.A column on walking tours, I walked—a lot. Mostly in the wrong kind of shoes. Turns out I do not own tennis shoes. Hey, I’ve covered parties for the last 16 years. Here’s what I do have: metallic gold tennis-like shoes and silver, bronze and red patent no-where-near-athletic shoes. If a story calls for me to walk for hours downtown in sparkly slippers? I’m your gal. Why mention this? Because my crumbling bronze kicks (ruined while trying to find the city’s Best Shoe Repair one August for our annual Best of LA issue) helped me talk to The Boy. Wanna meet someone? The Los Angeles Conservancy’s Downtown Tours are packed with interesting people aged from 18 to 80. There are so many participants for each of their tours (which all meet at about the same time) that they divvy you up into groups when you check in. For Historic Downtown, for example, there are sometimes five walking groups to choose from. Thankfully the lanky blonde fella with the cute dimples was in my group…with his mother. Not a problem. Where there’s a will, no mother will get in the way. I angled myself next to him at each opportunity and talked to Ma knowing sonny-boy was the next stop. My heart started to flutter as we trudged up a hill to view a hidden mural and I noticed him loping along beside me. I looked up at him in all his shaggy, earnest granola-ness and he looked down at me and my bronze footwear covered in patches of the wrong-colored metallic shoe polish and said, “Don’t those hurt your feet?” I didn’t get his digits in the end, but I did get new shoes—tennis shoes.